The aim of this study is to review the GnRH agonist triggering outcomes in comparison with hCG in the prevention of ovarian hyperstimulation syndrome and in pregnancy rates. The keywords used for the construction of this article were: ovulation induction, ovarian hyperstimulation syndrome and gonadotropin releasing hormone. The following database: Pubmed, Lilacs and Scielo were analyzed. The articles published from January of 2005 to October of 2015 in Portuguese, Spanish and English were selected by two researchers independently. If disagreement a third researcher was consulted. The inclusion and exclusion criteria were based on the main systematic reviews about the subject available. The inclusion criteria were: studies using GnRH agonist (GnRHa) for triggering that described its outcomes in pregnancy rates and/or OHSS, women with age between 18 and 40 years, BMI between 18 and 35kg/m2, non-smokers and with ovarian reserve of 3 or more antral follicles. It was excluded from this review, women that had any uterine pathology or malformation. One hundred and fifty four published articles were found considering the keywords and filters used in association. After their abstracts reading, twelve articles were selected for posterior full read. From these, nine fit the inclusion criteria. The method was described in the form of a fluxogram represented in Fig. 1. As a systematic review, approval of the local Research Ethics Committee wasn’t necessary. Fluxogram of the methodology used in this systematic review. The articles data were summed up in Table 1 for comparative analysis. From 9 selected studies, seven were prospective including randomized clinical trials and cohorts. The oldest paper is from 2005 by Kolibianakis et al. fulfilled in two human reproduction centers, one in Belgium and the other in Germany whilst the most recent is from 2014, by Decleer et al. The highest population assayed was in Spain with 1171 women and the smallest in Cyprus with only 44 patients. 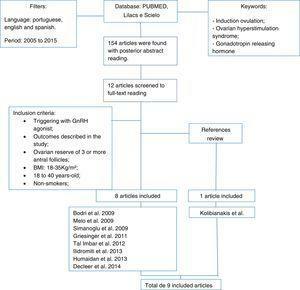 Outcomes described in the systematic review. GnRHa, gonadotropin releasing hormone antagonis; hCG, human chorionic gonadotropin; OHSS, ovarian hyperstimulation síndrome. Studies show a comparison between hCG with GnRH agonist and isolated hCG. Kolibianakis et al.,8 in his randomized clinical trial, with 106 women in two European centers found in one of them statistic significant decrease (p=0.012) in pregnancy rate in the agonist use group (5.6% vs 41.7%) and a clear reduction, though not statistic significant, in the same group in the second center (2.9% vs 16.7%). Higher implantation rate was also described in the hCG group and no OHSS case was observed in neither one. Thus, no advantaged of the agonist was noted in the study. However, the others screened studies demonstrated better results. Melo et al.9 made a prospective randomized cohort with 100 oocyte donors. No OHSS was found in the agonist group vs 16% in hCG group whilst the implantation, pregnancy and miscarriage rates were similar in both groups. Bodri et al.,10 in the same year, observed resembling results in his retrospective study with higher population (n=1171). Thirteen cases of OHSS (2.08%) in the hCG group and none in the agonist one was found and comparable outcomes between the groups as clinical pregnancy rates: 42.4% vs 38.8% and implantation rate: 29.1% vs 25.9%. Simanoglu et al.,11 in a prospective study with oocyte donors, also found absence of the syndrome in the agonist group against 4 cases in the hCG one. The association of final oocyte maturation with GnRH agonist and posterior freezing of oocyte and embryos (freeze-all strategy) is another method. Devroey12 proposed the possibility of an OHSS free-clinic with this approach in an opinion article. Griesinger et al.13 used this strategy to evaluate its results in a prospective multicenter study with OHSS high-risk women. Of 51 patients, 4 (7.9%) developed the syndrome, being one of them a severe case. Fatemi et al.14 also presented two clinical cases in United Arab Emirates and India who developed the severe case of the pathology with the use of the same approach, what demonstrates that an OHSS free-clinic is chimeric. Meanwhile, the pregnancy and live births rates were favorable with the protocol aforementioned. Ilidromiti et al.15 compared the maturation with GnRH agonist associated with luteal phase support with progesterone in patients with higher risk of OHSS (n=363) with patients who received conventional dose of hCG (n=257) in a retrospective cohort. Only one case of OHSS occurred in the agonist group against 18 cases in the control group. Clinical pregnancy and live birth rates (30% and 29.7%, respectively) were similar whilst miscarriage rate was lower in the agonist group. Tal Imbar,16 in an observational prospective study, associated the use of agonist as trigger with luteal support with progesterone and freeze-all strategies and comparing with isolated use of agonist. Humaidan et al.17 produced a prospective randomized study also comparing the use of hCG with GnRHa and luteal support, but with use of hCG, instead of progesterone. Three hundred and eighty four women were classified in higher and lower risk of OHSS (criteria used was the presence of more than 14 ovarian follicles). In the higher risk group (n=118), half of the patients received GnRHa with 1500U hCG support and the remaining received 5000U hCG alone. In the lower risk group the support was made with two doses of hCG. Before this conduct, none cases of OHSS were observed in the higher risk using GnRHa while two cases of the syndrome in the hCG alone group occurred (1.6%) and the reverse happened in the lower risk patients; two of the agonist group developed OHSS vs none in the hCG group. This strongly indicates the use of agonist only in higher risk patients. Other results as implantation, pregnancy and miscarriage rates resembled between the groups. Ilidromiti et al.,18 in the same year, through an multicenter retrospective study showed improvement of pregnancy rates with this luteal support with hCG but with OHSS occurrence (0.72%). Decleer et al.,19 in his randomized clinical trial, compared the oocyte final maturation (GnRH +5000U hCG) with the use of hCG alone. In neither group OHSS occurred as implantation and pregnancy rates didn’t show statistic differences what didn’t justify the use of the combined medication. The use of GnRH agonist for oocyte final maturation was comparable with hCG and some studies didn’t demonstrate statistic differences in implantation and pregnancy rates. Few studies that associate hCG with GnRHa didn’t demonstrate statistic differences in the rates aforementioned. The efficacy in decrease ovarian hyperstimulation syndrome also is clear when not associated with hCG. The association with freeze-all strategy promotes even higher reduction of the syndrome. However, its complete elimination remains a challenge. End-of-course paper presented to Medicine Course at Pontifícia Universidade Católica de Goiás as parcial requirement to obtain the title of doctor. Advisor: Doctored Professor Eduardo Camelo de Castro.